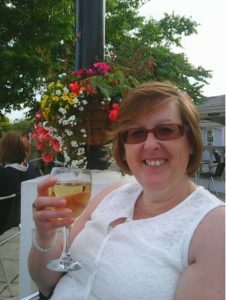 Christine (Chris) Bennett, a 54 year old Special Needs Teacher; a Mother of four children and a Nan to four grandchildren, joined Basis to support her husband. The last year she has seen extremely life changing events as she suffered a stroke in June 2015, whilst getting ready for work. The swift actions of her Doctor and Stroke consultant saved her life. Chris had a blockage in the brain; an injury to the central lobe cutting the flow of oxygen and blood around the body. The treatment she received since has allowed her, a year on, to begin to build her life. After having no feeling down her left side for 72 hours the blockage was slowly released through a drug; she was Thrombolised. There are not many NHS trusts who allow this expensive drug. Chris feels she is lucky to be alive and has since gone on to write a book called: ‘A Stroke Of Luck’. Chris has discovered Basis through her Husband who has more recently come to terms with sight loss and has needed to adjust his life accordingly. They both support one another and Chris felt that she was able to support her husband and others at Basis, sharing her teaching skills at manageable times, as she is unable to return to a job that she loved. Her life has changed but she feels able to help others and Basis is a worthy community Charity to Support.